with no one but the moon. I was on the road with no camera, so I’m really thankful that you got up in the cold and captured this very nice image for us all to enjoy. Thanks, Linda. I’m glad you enjoyed it. I must confess I didn’t suffer much from the cold, as it was in the fifties at 6 a.m., but the fog and haze that often come with the warmer weather weren’t a problem. I had clear skies until totality — just long enough for this photo. Wonderful photo. I went outside this am and all I saw were trees and clouds. I am so glad you got this lovely image. I was pleased to have clear skies for this eclipse, Yvonne. There have been more times than I can count that the clouds have rolled in. This time, I didn’t even have to leave home. I just made coffee, went out on the balcony, and tried to get a decent photo. It was great fun. Wow! Like Ms Pets, all I saw was clouds. You win the prize–a gorgeous shot! I can’t remember ever being able to watch the entire process in person, from the first bit of darkness to totality. By that time, it was nearly to the treeline, and was being obscured by haze and clouds, but it was great fun while it lasted. It looks like our next chance for a total lunar eclipse is May 26, 2021. Mark your calendar! I do like the crescent. It reminds me of a necklace hanging from a chain, or the sort of decoration you’d find on a horse’s bridle. We don’t often consider it, I suppose, but it is quite something to think of these various bodies just hanging in space. I like what you got of the eclipse. We had snow overnight so there was not an opportunity for a shot here. I did get a few shots tonight and was impressed with the gold color of the moon. 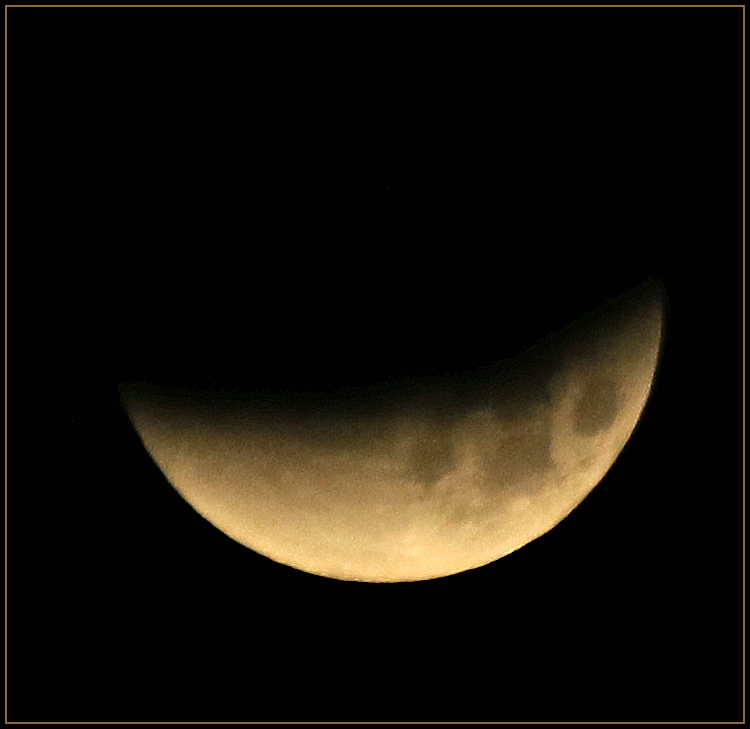 When the eclipse began, the moon was whiter, but as it progressed, the golden color became more pronounced. Even if I’d had the lens and the skill to capture the reddish color at totality, the moon already had disappeared into our low-level haze. I’m glad it was visible for you tonight. The moon is the moon, after all, and beautiful on every night. I’d forgotten that song. Here’s a version by Radka Toneff that I’ve always found compelling. The Judy Collins version is the one I’m familiar with. Now I also like the one you’ve linked to by Radka Toneff, whom I confess I’ve never heard of. Her own life experience may have contributed to what I hear as an especially haunting rendition. According to her Wiki page, “Her life flame burned short and intense, she left the world by her own hand at a young age [30 years old], and was found dead in the woods of Bygdøy, with an overdose of sleeping pills in her blood, the autumn of 1982. A perfect poem for this fabulous image. I didn’t get up in time but even when I did, it was so cloudy I think I would have missed it. Moon looks pretty good this morning, too! And this morning? The clouds moved in here, and even though the moon was visible, it was covered in haze and often completely obscured. So this was your morning for moon-viewing. Even without an eclipse, it’s a beautiful sight. I’m going to get some Mary Oliver anthologies. I don’t think you’ll be sorry. As with any poet, there are some of her poems I’ve read so often they’re memorized, and some I’ve never given a second glance. But as a whole, her body of work is stimulating and delightful. I was certainly up in time to view this, but our skies were too cloudy, more’s the pity. Thank you for providing such a lovely shot! You know, there’s something to be said for that old adage about the early bird getting the worm! And this morning, we had cloudy skies. As with so much in life, we take what we’re given, and make the best of it. But don’t worry that you missed it this time. There will be another one in 130 years or so! Great! And if medicine keeps improving, perhaps we’ll be around to see it then! I have a love/miff relationship with Mary Oliver. I love her because she has such a way with words, and I get so miffed at her because she has such a way with words and I wish I did too. Welcome to the club, dear one. I suspect the number of people who experience that same love/miff relationship are legion. I certainly count myself among them. On the other hand? There are things about us that Mary Oliver might envy. All we have to do is figure out what they are, and polish them up a bit. Beautiful image, such a oh heartbreakingly delicate song, thank you. After many days of plus 40C temps, it actually rained an inch on the night of the eclipse, so no chance of seeing anything. However, the rain was most welcome, for clearing the air, and putting water into tanks. As for Mary Oliver’s poem, thank you, I’d not come across it before. In your situation, if rain came along with the clouds, I wouldn’t fuss, either. We’re moving toward drought ourselves, and a little rain (or a lot) would be welcome. I debated which poem to use. I also considered using this one, but decided to stick with the more specifically moon-related. Thank you, I explored that link, nice. I’m not sure I’ve seen this Mary Oliver poem, and it’s wonderful. I love the idea she gets down here, so eloquently, about the moon listening then turning away. And you made a beautiful photograph from that eclipse, wow! I see from the comments that you didn’t even have to be up at 3am and driving all night, etc. Beautiful! This is the first series of moon photos I’ve been happy with. Being able to watch the eclipse from its beginning to totality was nice; in the end, I thought the crescent was more interesting than the full moon. Mary Oliver’s always of interest. There isn’t much in the world that escapes her notice, and her fine way of expressing what she’s seen nearly always delights me. The fact that she’s far more than a “nature poet” only adds to her appeal. When I recently learned that she’s 82, I was astonished. She seems ageless to me. Ooh! Wasn’t it wonderful? You really captured the mystery of it Linda. We have been treated to so many fantastic lunar experiences this year. It was wonderful, Kayti. And I confess I was amused by being able to wander outside, coffee in hand, to watch the proceedings. One of the most interesting sites I came across when I was reading about the eclipse actually was a NASA site: a list of moon songs. They have everything, from Sinatra to Creedence Clearwater Revival, and a lot of groups I’ve never heard of. One of my favorites was “Idaho Moon.” There’s no coyote howling at the moon, but there is some great yodeling. I hope the next time an eclipse comes around, you’ll have sparkling clear skies. It is wonderful to see. I’d hardly given this one much thought, which made for an almost unexpected, easy experience. It’s been fun to share it — both the photo and the poem. Makes me think of the relationship with the tides. Thanks for sharing it. I’m glad it appeals to you, Maria. I think the imagery is remarkable. Every time I read it, I see a moonlit path on the water. So glad that you had clear skies for a great view of that moon; the rainy season has arrived, so the moon was shrouded with a thick cloak of clouds as well as mist and rain. The Mary Oliver poem is lovely – most likely everyone has shared those silent pre-dawn visits with the moon, but Ms Mary captured it in that poem. Since the eclipse, we’ve had nothing but clouds: the kind of heavy, dull, sky-obscuring clouds that make the day feel truly oppressive. We haven’t had much rain, though, and that seems almost unfair. If we have to put up with clouds, we should at least get the benefit of rain! But I did get to see the eclipse, and I’m grateful for that. Not having to exert myself to do so was a lovely side benefit.